Cape Town is full of people that love nature deeply. People learn, experience and express this love differently. This love is learned and expressed through the telling of folk-stories about water bodies like Princess Vlei and impressive land feature like Table Mountain. It is also learned through the painstaking categorisation of soil, plants and animals for scientific study. This love is expressed through gardening of fruit, vegetables and traditional medicinal plants, hosting significant traditional ceremonies on Table Mountain and meditative recreational hikes through the peaceful silence of natural areas. Not all of these ways of loving nature are supported as they should, and not everyone has equal access to nature in the way they would like. Similarly, not all biodiversity treasures across the city are protected equally. Below is an illustration of this 'environmental inequality' in Cape Town. The image on the left is a satellite photo from Delft, a low-income township on the Cape Flats, and the one on the right shows Newlands, a wealthy suburb in the Southern Suburbs. For the sake of people, who need the natural water and plants systems to survive, and for the sake of nature, who needs preservation to survive the enormous pressure we exert over it, we need to focus our love for nature into a strategy that takes both these causes forward simultaneously. People need nature; nature needs people. If we don't care for people, nature suffers. If we don't care for nature, people suffer. People and nature are one and the same entity and so taking care of this peopled-nature requires a strategy that love both people and nature at the same time. In and amongst low income densely populated areas there are bundles of land that hold treasure troves of indigenous plants. Traditional know these spaces well. These have been labelled irreplaceable by conservationist because these bundles of land are very rare and under serious threat from development. Based on strategies that are set out by the city, most importantly the city's Biodiversity Strategy, we shape our plans to fit in with this larger strategy. The City of Cape Town has identified various areas that are important for biodiversity. 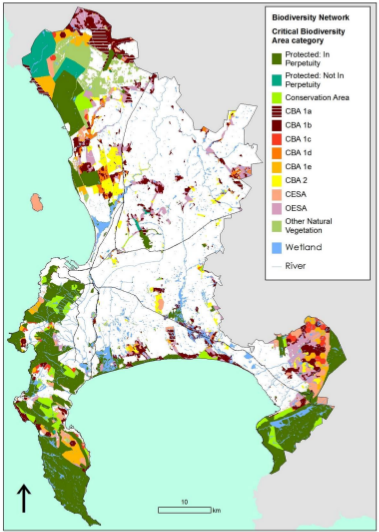 We base our efforts principally on the work done by the City of Cape Town, when it identified and prioritised a biodiversity network, starting in 2006 (this system is nowadays referred to as BioNet, and more about it can be read in this initial report from 2006 as well as a more recent analysis). This open-access academic article further describes the plans. BioNet principally consists of prioritisation of biodiversity protection in the most important hotspots in the city. However, Communitree's focus is not so much on the protection of existing sites but rather on the introduction of vegetation in sites that have been 'lost' to housing, commercial use, or other human intervention. This images of the transformed landcover (left) and Biodiversity Network (right)provide a useful initial input for us to see where we can focus our activities. Low-income neighbourhoods are generally the ones poorest in vegetation, and are therefore of our highest priority. Sometimes small compromises are necessary and non-invasive exotic species are planted to bring other benefits that native species can't bring. 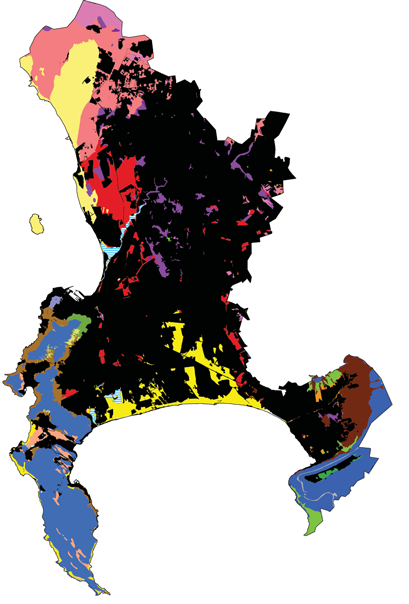 The goal is to take into account the original vegetation cover in Cape Town, and to place special focus on the corridor hubs and nodes as identified in the map above.